PostViews are off-the-cuff thoughts on specific aspects of a film that we would like to address. They may not cover all the broad strokes of a film and will appear in lieu of a full review. I really, really, want to love director Marc Webb‘s new Spider-Man reboot, but when I watched the first film two years ago, and the sequel now in theaters, all I’m reminded of is a cash grab by Sony. While this latest Spidey film is at times exciting to watch, many times I found myself asking “what exactly is going on here?” (both narratively and technically). In the end, everything really did circle back to this post-Avengers world that moviegoers now live in where multi-film franchises are now the norm and all superhero properties must do world building to continuously provide movies for studios pump out. 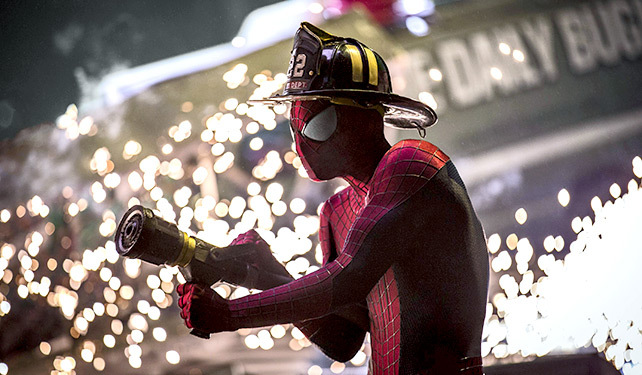 Here are a few thoughts that I had after taking in the latest Spidey film, The Amazing Spider-Man 2. Within the first 10-15 minutes of the film I was immediately taken out by the obvious and overuse of CGI. Now don’t get me wrong, superhero films necessitate the need for CGI effects. I mean, you can’t have Bruce Banner transforming into the Hulk or larger than life helicarriers without an visual artist magically crafting these images on a computer. However, in the opening sequence of the film Spider-Man uses his amazing agility to catch about a dozen vials as they get dislodged from their container and go bouncing around the truck they’re being carried in. While I know Spidey is that good, the scene plays out lightning quick with him grabbing and web shooting each and every vial at an inhuman pace. Visually, I know Andrew Garfield is not moving that fast, but nonetheless there is Spider-Man moving at breakneck speed. While it fits with what the character can do, it didn’t fit or feel right within the realm of believability. In short–it looked fake. Yes, when watching a superhero film, you do need to suspend some disbelief. However, movie magic and visual effects behind a film should transport you to another world; not take you out of it. While there are many fine and believable uses of CGI throughout the film, there are a number of sequences, similar to the one in the opening sequence, where it looks too fake. Though I did lament this point in Iron Man 3 overall Marvel is pretty good with their blending of practical and CGI effects work for their characters. I don’t know if Sony could have done any better if they had more time or put more money into the effects, but I think they should have changed some of these scenes to accommodate more “real” and practical effects work. Just two kids looking for love in a topsy turvy world. As with the first film, I thought that the relationships again were the highlight. The chemistry between Garfield and Emma Stone was great and every time there was interplay between their characters it just felt really authentic and kept drawing me back into the film. Stone is always solid with relationship roles, but combine that with Gwen’s knowledge of Peter’s secret and you have a dynamic that’s interesting because of the tension that it causes between them. One thing that got tired in the Sam Raimi series was all the angsty drama that resulted from Mary Jane never knowing Peter’s secret identity for nearly two films. Unencumbered by that here, Gwen and Peter’s relationship is actually strengthened by her knowing his secret and the film is all the better for it. Another great relationship, though is a bit short lived, is the mother/son relationship between Peter and Aunt May. Probably more so than in the last Amazing Spider-Man film I thought this relationship was really well presented in the film. While there is just one big scene which pretty much sums up the extend of the relationship, it’s still very heartfelt and very well acted by Garfield and Sally Field. Not even in Raimi’s version of Spider-Man did I feel this kind of relationship between Peter and Aunt May, so overall, great job by Webb in developing these relationships and making them really shine. One thing I think a lot of people were worried about (myself included) was the much alluded to battle/joining of forces between the purported three villains that were showcased in all of The Amazing Spider-Man 2‘s promotional material: Electro, The Green Goblin, and Rhino. In Raimi’s Spider-Man 3 its trio of villains essentially overpowered the film and chopped up several story lines which didn’t give the film cohesiveness and led to the downfall of that picture. Again, going in, I was worried if Webb and Sony even knew what they were doing by putting three villains in another Spider-Man film. Could they make the same mistakes again? While some may say that Sony hasn’t learned their lesson with including too many villains in a film, I’m going to say that they handled the three villains in a more responsible and measured way this time around. Without venturing into spoilers, there really is only one villain in this film with another just along for the ride and the last of three not really needing to be included save for table setting for the Sinister Six film (more on this in a bit). While the two main villain plot lines become intertwined, I felt that they were handled fairly well and there was enough room in the film for everyone’s story to breathe and not be bogged down by having two many arcs run rampant and not given them their due. In this sense, Sony did learn their lesson and essentially and toned down the villain count to make the overall story of the film more cohesive than in Raimi’s Spider-Man 3. Just like Peter Parker alone on a rooftop, Marvel Studios looks out at Sony, Fox, and Warner Bros as they try to jump on the superhero bandwagon. Finally, perhaps my biggest gripe against this film is the way it made me compare what Sony is doing with Spider-Man to what Marvel is doing with the Avengers. I touched on this in my intro, but I’ll be more specific here; there are a number of times in The Amazing Spider-Man 2 where things are done for no other reason than to set the table for future Sony films involving Spidey and other characters from this world–which I think is a detriment to this film. I couldn’t help but make these comparisons to what Marvel is doing because while Marvel is very smart about their world building and uses a lot of subtlety and nuance, Sony uses a hammer and hits you over the head with their table setting. While Sony has come outright and said that they will be developing a Sinister Six and Venom films, this does not excuse them from leaving blatant setup and plot points for those films in this one. In many ways The Amazing Spider-Man 2 could be considered the Sony equivalent of Iron Man 2 with all the world building that they’re doing here. Case in point, with their in-credits and post-credits scenes aside, the entirety of a Marvel film is strictly dedicated to a self contained story arc. While the results of each Marvel film affect future films, there aren’t really any direct influences from one film to the next. Past events are referenced, or flashed back to, but nothing in a Marvel film blatantly setups anything in future films. In fact, after you watch a Marvel film, it makes you want to go back to see how far back in past films Marvel started planting seeds. With Sony, they basically come right out and tell you that “hey, a couple of us bad guys in this film, we’re going to be in the next film.” While it’s no secret that large events in the comics are making their way into the films, you’d like to think that it would be presented in a way that’s organic and seems natural. As a result, there are quite a number of elements that are left unresolved at the end of this film and though not necessarily bad, I just personally think it’s lazy storytelling. There are ways to hint at things without specifically stating them or leaving them open ended. Only films that have parts (ie: Part I, Part II) should be able to get away with that. At the end of the day I felt that The Amazing Spider-Man 2 was a mixed bag. On the one hand there are some very well choreographed scenes and fights with some great emotional moments with Peter and Gwen and then again with Aunt May. But on the other side of the coin is overuse of CGI that took me out of the film numerous times coupled with the obvious table setting that Sony is doing for future installments. In many respects my concerns mirror the complaints of many critics who have been saying that the film is essentially more flash than substance. While not totally off base I do see what a lot of them are saying. Like it or not the Sony machine will be pumping out Spidey films for the foreseeable future, with Webb along for at least one more go around. As other studios do their best to mimic the Avengers model with multiple character movies leading into mega-team up films, only time will tell if Sony can course correct and learn from the misfires from The Amazing Spider-Man 2 in much the same way they learned from their mistakes with Raimi’s Spider-Man 3. I won’t be holding my breath. The Amazing Spider-Man 2 is currently playing in theaters everywhere.